Equities saw their largest inflows in 11 weeks in the week that ended on June 3, with the contrarian “buy” signal triggered in early January still in place, data from Bank of America Merrill Lynch showed. Sentiment is right in the middle, between extremely bearish and extremely bullish. 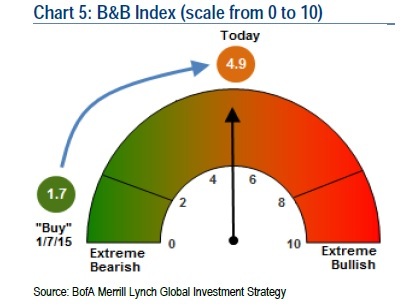 On a scale between 0 and 10, or from “extremely bullish” to “extremely bearish,” sentiment was in the middle, at 4.9 last week. Sentiment was neutral for all six components of the bear/bull index: long-only positioning, credit market technicals, equity market breadth, hedge fund positioning, bond flows and equity flows. Looking strictly at flows, equities saw their largest inflows in 11 weeks in the week that ended on June 3, at $5.9 billion, with $8 billion going into exchange traded funds (ETFs). Inflows into Chinese equity funds were $2.5 billion, driving emerging markets equities and helping them to post their third straight week of inflows, worth a total of $1.2 billion. European equities saw inflows for the third straight week too, but momentum is waning with just $800 million going into the asset class last week. “The Greek debt saga and the recent Bund selloff, mixed with challenging market liquidity, have put a strain on fund flows into risky assets,” the analysts at Bank of America Merrill Lynch said. US stocks saw $900 million in inflows, the largest in 11 weeks and all via ETFs. Japanese equities, which saw inflows in 14 of the past 15 weeks, saw another $100 million going in last week. In the fixed income field, emerging market debt funds saw their largest weekly outflows in 19 weeks, worth $700 million, possibly due to better-than-expected US data that raised expectations that the Federal Reserve will start raising interest rates sooner, rather than later. Many investors fear that a rise in US interest rates would drain capital out of emerging markets, which are perceived as riskier. Bank loan funds saw modest inflows of $98 million, in the fourth week in a row of inflows. Investment grade bond funds marked their 76th straight week of inflows, worth $4.1 billion. High yield bonds saw inflows for the third straight week, taking in another $800 million. This entry was posted in News and tagged bear, bearish, bull, bullish, capital flows, China, Chinese equities, Chinese stocks, emerging markets, emerging markets bonds, emerging markets equities, European equities, European stocks, eurozone equities, foreign exchange, investing in emerging markets, investing in equities, investing in stocks, Japanese equities, quantitative easing, sentiment, US equities, US stocks on June 8, 2015 by Antonia Oprita.